When someone ends up playing eight years in the majors, you can usually look back on their minor league career and see a natural progression to the majors. They may struggle a little at first, but rarely do you find someone who can look like they bottomed out after five seasons of pro ball, only to go on to turn things around the following year and enjoy a long Major League career. Pitcher Bryan Clark is the player who is the exception to the rules. Drafted in the tenth round in 1974 by the Pittsburgh Pirates out of high school, Clark was in the Gulf Coast League by his 18th birthday. Except for some command issues, the 6’2″ southpaw had a decent debut. The scouting reports said he had a strong fastball and some deception to his delivery. Clark posted a 3.34 ERA in 62 innings that first season, though his 40/47 BB/SO ratio left something to be desired. He didn’t improve that command the next year or even the year after, it actually took awhile. In 1975, Clark moved up to Charleston in the Western Carolinas League, which was a very aggressive promotion for a teenager. In 12 starts, he had a 5.37 ERA and 67 walks in 57 innings. Those obviously aren’t good numbers, but he was young for the league, so you would expect him to struggle. At the mid-point of the season, he was demoted to the New York-Penn League, right when the short-season teams began their schedule. He saw his ERA go down to 4.50 and he walked 71 batters in 74 innings. The NYPL was more in line with where he should have been that year. The problem is that he ended the season with 138 walks and 37 wild pitches in 131 innings. Returning to Charleston in 1976 for the entire season, this was about the time when Clark seemed extremely far from reaching that big league dream. While he was still young for the league, he didn’t show any signs of improvement. He had a 6.12 ERA and 104 walks in 103 innings. He also threw 31 wild pitches and posted a 1.95 WHIP. There were some good signs to his career that get lost in the poor stats. He allowed exactly one homer in each of his first three seasons. The age helped his case and the fact that he was a lefty would give him some extra chances in the minors. Clark also allowed less than a hit per inning in each of those first three seasons. Things were bad, but they would get worse. 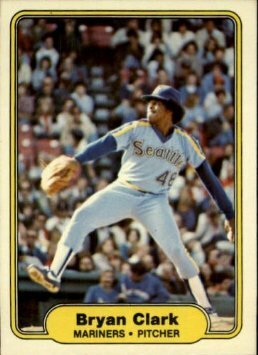 The 1977 season actually saw him get promoted to High-A ball and again, there were some good and bad signs to his season. For the first time, he had more strikeouts than walks, posting a 105/108 BB/SO ratio in 125 innings. Clark lowered that ERA to 4.75, which was actually right at the team’s total ERA(4.79) for the season. On the flip side, he allowed 11 homers and 135 hits, leading to a 1.92 WHIP. Four years into his career, the 21-year-old was a pitcher dealing with command issues in A-ball and things still got worse before they got better. In 1978, Clark was back down in Charleston and he had a 6.11 ERA in 56 innings, allowing 55 walks and 55 hits. The Pirates gave up on him at this point and in June they sold him to the Seattle Mariners, a team in their second year of existence. They put him in the high-offense California League and he got hit around to a 7.33 ERA, briefly dropping down two levels to the Northwestern League to help try to get him on track. You have to wonder what the chances are that someone in their fifth year of pro ball, puts up a 6.31 ERA in A-ball and he still makes it to the majors? Then you have to add in that he has walked a batter per inning during his career as well, and wasn’t a high strikeout pitcher. Clark did make it to the majors though, and his career turned around in a big way just one year after it seemingly bottomed out. In 1979, he ended up back in the Carolina League and posted a 2.64 ERA in 23 starts. He walked 112 batters in 167 innings and gave up 124 hits. That was followed by a season that saw him pitch well in AA, before hitting another potential roadblock in AAA. In eight starts for Spokane in the PCL, he had a 5.27 ERA and walked 37 batters in 41 innings. What looked like a tough time in his AAA debut that could lead to him returning to AA, was overshadowed by the fact he was pitching for a team coming off a 103 loss season. Clark was in the right place at the right time and for many players, that is how their Major League dreams are realized. He capitalized on that chance by winning a job on Opening Day in 1981 with Seattle. In fact, he lasted the entire season with the Mariners, just three years removed from returning to short-season ball during his worst season in the minors. Clark would spend eight seasons in the majors, making 37 starts and 149 relief appearances. He posted a 2.75 ERA in 114.2 innings in 1982, and followed that up with 162.1 innings the next year. His walk numbers were much better in the big leagues, never approaching those minor league numbers that held him back. He is a great example of perseverance while attempting to chase his dream. Many players don’t get chances to fail like he did, but he also didn’t quit when he was back in short-season ball five years into his career. He wouldn’t have got the time of day from someone putting together a prospect list because players like that very rarely make it, even with 3-4 bad years before they figure things out. Clark proved that you could hit your low point and still make it to the majors and not only that, he stuck around longer than most pitchers. That makes him a positive example for minor league players who feel like they are losing their big league dreams.